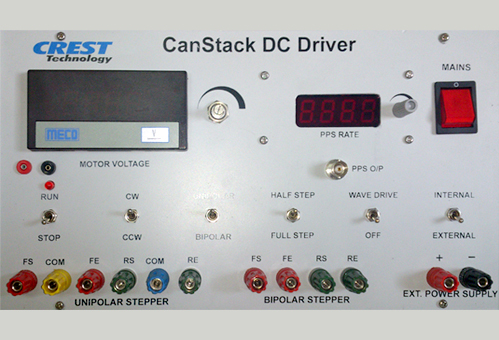 DC Stepper Motor Driver – Crest Test Systems Pvt. Ltd. The Stepper Motor Driver has a variable DC power supply and a control circuit to drive Unipolar and Bipolar motors of all specifications. The Stepper Motor Driver is available in benchtop configuration but can also be provided in a 6U chassis-mount construction. The operator can set the values for operating voltage and PPS rate, and select the direction of rotation, motor type (unipolar/bipolar), and drive (half step/full step/ wave drive), depending on the specifications of the motor. There is also a provision for connecting an external power supply. Additionally, chopper drive, indexer, and microstepping can be offered if required as add-ons to the standard configuration.